Where does my torso go in humble warrior? While doing Humble Warrior pose, am I supposed to rest the weight of my torso on my thigh while folding forward, or use my core strength to support it? Love your vids, btw. I am seeing a considerable change in my body shape and dealing with my arthritis much more effectively since discovering your series and embracing aspects of the practice. Great question Lisa. 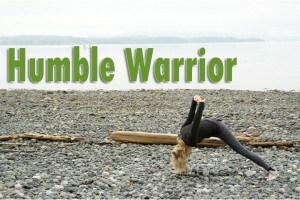 I had to look into this, because humble warrior was not a pose that we did at the studio “I grew up in” 😉 Eventually, humble warrior will end up on the inside of your forward bent leg, so, if your torso is going to be on the inside of your forward bent leg – you may even be able to bring the top of your head to the floor! So as you mentioned in your question, when your torso is on the inside of your thigh, then you will be using your core strength to support it, until your flexibility allows you to forward fold more. Be aware of your shoulders and lift them up and away from the floor, not allowing them to drop down. 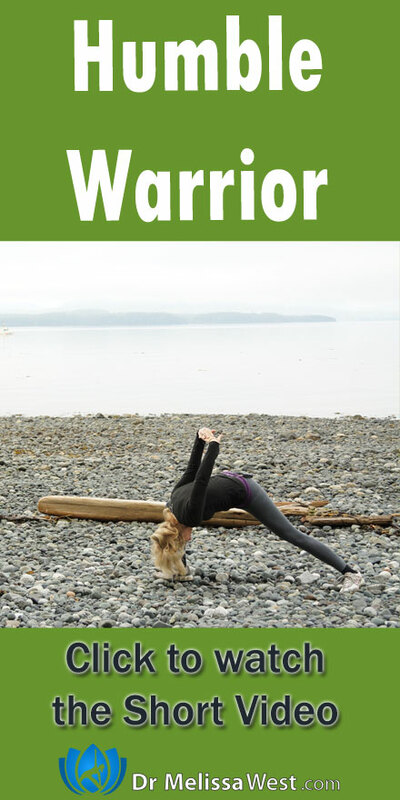 Humble warrior will strengthen your legs, open your hips and open your shoulders and chest.